I have a notorious inability to read at night, especially if I’m tucked in bed. With two sentences under my belt, I generally find the third sentence nearly incomprehensible. It’s not really the author’s fault. (Well, not usually.) By the third sentence I’m generally well into my semi-conscious, confused state of mind and I may as well shut the book and go to sleep. However, my latest read grabbed me at the first sentence and never let me go. 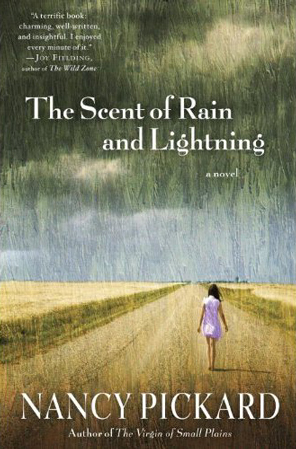 The Scent of Rain and Lightning by Nancy Pickard is the story of Jody Linder who, at the age of three, lost both her parents in a double murder that rocked the small (fictional) Kansas town of Rose. It goes on to describe many ways tragedy could strike at any given moment. As a woman whose whole life was defined by an act of violence that shattered her world and changed its course, she has reason to think the way she does. Yet over the course of the book we experience the ways that Jody has adjusted. We understand the role her grandparents had, her uncles’ protectiveness, even the way the Testament Rocks (named after the real Monument Rocks in Kansas) provide a tie to the past. Like the breadcrumbs left by Hansel and Gretel, the clues to the mystery are deftly dropped throughout the book. It’s a great story, exceedingly well-written. Love, loss, alcoholism, abuse, corruption, infidelity, goodness, forgiveness, understanding, integrity…the book is swimming in “issues.” And, yet the plot never overwhelms the characters. This book felt like storytelling at its finest. Check it out!